I’ve always regarded myself as a bad cook. Breakfast in bed on Mother’s Day would end in blaring smoke alarms, ruined pans, and a lot of wasted bacon. And with that notion planted in my head, I’ve never really tried to cook for myself. For sixteen years of my life, my mom had packed homemade lunches for me to enjoy; lucky, right? Unfortunately, it left me with the crippling realization that I was intimidated by making scrambled eggs. When 2019 presented itself to me as a time for real change, I decided that I would learn to actually make meals for myself and my family. Or, at least, I would try. Though it seems a little bit backwards, I started with baking. Sorting through my Youtube recommendations, I stumbled upon a video of how to make a Japanese cheesecake. Being honest, I didn’t need to start with something as difficult as that; it required me to make a meringue (what in the world even was that?) and needed me to melt the cream cheese and butter on the stove top, which I totally regarded as an intimidating fiery machine of death. But, it was a Saturday night, so why not? I didn’t really have anything to lose. Having literally no prior baking experience, I’m surprised I wasn’t more nervous, but I think I was too enticed by the thoughts of jiggly, fluffy deliciousness to focus on my fear. I finally pulled the fruit of my labor from the oven at a shocking one AM in the morning, but it was so worth it. It was absolutely delectable! Even my mom, who had tried to stay up with me but ended up sleeping on the couch, woke up to the sweet aroma and said that she wouldn’t have hesitated to purchase it from a bakery. Powered by my swelling pride and ambition, I decided I would make another one the next day for my aunt to take home, since she was stopping by our house later in the evening. The second cake turned out even better than the first, and I made it official that that was my first triumph in the culinary world. In the week that followed, I began preparing my lunches in advance (the solution to prioritizing sleep AND making it on time to dreaded zero period). 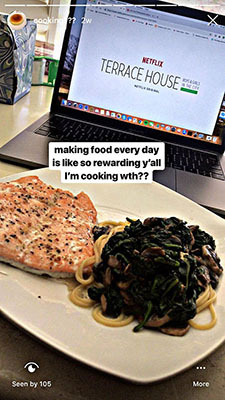 Grilling cauliflower, baking salmon, boiling pasta, all of these were tasks I slowly learned to grow more comfortable in as I relied less on my mom to help me. Sure, it got a little boring eating the same couple things throughout the week, but it was more worth it to realize that I could apply these skills to other foods that I wanted to cook. Pan-frying some zucchini is basically the same thing as pan-frying sweet potatoes if they’re cut in the same shape and you know what they look like when they’re cooked. I’d be lying if I said I did this all on my own, though. While I did say I relied on my mom less, she’s still the one that taught me the basics. How was I supposed to know that salmon should be baked at 325 degrees for 15 minutes in our specific convection oven? Thanks to her, I can confidently prepare a good variety of dishes that would’ve seemed impossible to me before. Plus, I never was aware of the feeling of accomplishment that I would get from eating something I made myself. It’s a type of self-fulfillment I haven’t felt before, and it’s incredibly addicting. It’s only been a month since I’ve started really cooking, so I can only get more excited as to what my skills will evolve to in the future. Hopefully, by college I won’t be living off Maruchan and cereal, but instead preparing meals for my friends and myself.